Maximuscle Progain is a distinctive formulation designed to deliver a convenient high protein shake to help increase muscle mass and size. With 480 calories containing complex carbohydrates and naturally occurring BCAAs, Progain provides a tailored solution to enhance your normal diet. Our optimised blend of BioMax True Protein delivers fast acting and slow releasing protein to help make muscle gains. Progain contains an impressive 480 calories in every serving, of which 120 calories are from muscle-building proteins. 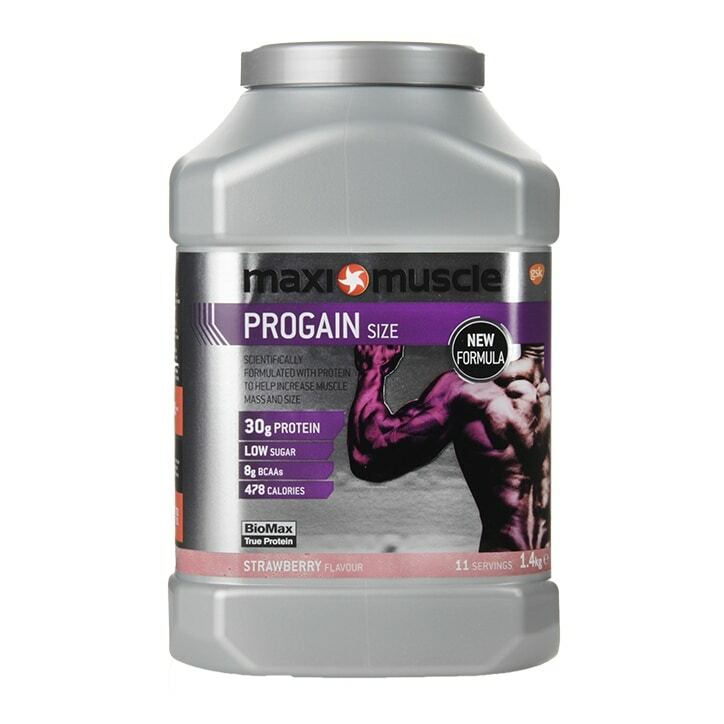 Specifically formulated to provide the additional proteins to gain mass, Progain is a useful addition to the diet for anyone looking to gain muscle mass and size. Every serving of Progain provides your muscles with 30g of high-quality protein to support gains in muscle size. Progain contains fast acting and slow release proteins to give you elevated amino acid levels in the blood for longer. Protein is proven to support gains in muscle size. Our protein formula naturally provides 8g of the Branched Chain Amino Acids (leucine, isoleucine and valine) in every serving. BCAAs are considered essential amino acids as the body cannot produce them itself and are required in our diets. Every serving also contains 6g glutamine, the most abundant amino acid in the muscle. Every batch of Progain is screened for banned substances and is registered with the Informed-Sport programme. milk protein concentrate), cocoa powder ( 7 %), fructooligosaccharide ( 5 %), soya oil powder , medium chain triglycerides , flavouring , sweeteners (sucralose, acesulfame K), thickener (cellulose gum), sodium chloride. MaxiMuscle Progain Powder Strawberry is rated 4.2 out of 5 by 6. Rated 4 out of 5 by Stell80 from Great taste This protein is great as it tastes good, easy to mix with no powder clumps. Rated 2 out of 5 by Cydoe from Hope it delivers as promised on the package. Started using this product just a few weeks ago. Hope it delivers.